Although the loss is an anomaly, given the team’s five-game winning streak, there’s a lot to think about in analyzing this game. Personally, I need to spend more time with my analysis. So instead, in this post, I will take a look over the past week and review some of the news reported by others who cover the Maple Leafs. Although the team is stressing Nylander’s on-ice success, I wonder what might break him out of this long slump. And, if he does break out, is he out for good? Would it be helpful to go back to playing on Auston Matthews’ wing? It seems interesting that I’m not hearing much outcry from fans about his lack of success, especially after his big contract. I also wonder if Nylander’s lack of success might become a bargaining chip for other teams faced with signing players in similar circumstances. In last night’s 4-0 loss, young star Mathew Barzal led the Islanders to victory with a natural hat trick. He became the third-youngest Islander (21 years, 217 days) to score a regular-season natural hat trick. The youngest? You might have guessed: Tavares at 20 years, 117 days. 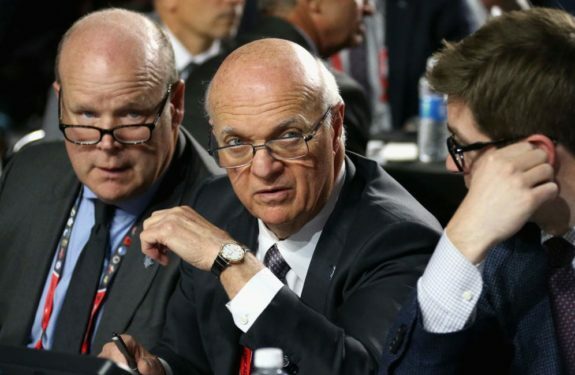 Lou Lamoriello, former general manager of the Maple Leafs and now general manager of the Islanders, brought his new team into town last night. As noted, it was a successful visit. Luke Fox of Sportsnet reported a story about Lamoriello’s relationship with Mathews, his last great Maple Leaf draft pick. As Matthews tells it, Lamoriello made a point to get to know his family, and they became very close. “My sisters loved him, my parents loved him.” Matthews reportedly was unhappy when Lamoriello left, but is pleased with Kyle Dubas’ vision and plan for the team’s future. Lamoriello has left a legacy with the Maple Leafs: he prepared the way for Dubas and also signed Morgan Rielly and Nazem Kadri to six-year deals that, with the numbers Rielly is putting up, look like bargains. He also traded for and signed Frederik Andersen, who’s already set a franchise record for wins in a season with 38. Related: Is Matthews the Best Maple Leafs’ Center Ever? The Maple Leafs have lost their number one goaltender, which might have hurt them in last night’s game. He is listed as day-to-day with a groin injury, the team announced on Saturday morning. Garret Sparks has replaced him for two games, but the Maple Leafs also called up goalie Kasimir Kaskisuo from the Toronto Marlies on an emergency basis. Later, the Maple Leafs announced that they traded a fifth-round draft pick in 2020 to the Florida Panthers for goaltender Michael Hutchinson. Hutchinson is a veteran with 106 NHL games between the Panthers and the Winnipeg Jets. Matthews, representing the Atlantic Division, will be one of four team captains during the NHL’s All-Star weekend next month in San Jose. Connor McDavid (Pacific Division) of the Edmonton Oilers, Nathan MacKinnon (Central Division) of the Colorado Avalanche and Alex Ovechkin (Metropolitan Division) of the Washington Capitals also won fan votes to earn the right to be captains for the Jan. 25-26 showcase. This will be Matthews’ third All-Star Game appearance and his first as captain. It is McDavid’s third time being captain in as many appearances. MacKinnon is also playing in his third All-Star Game, and “grizzled” veteran Ovechkin is playing in his eighth game. This week, Gino Reda spoke on TSN 1050 radio about who he thought was the MVP of the Maple Leafs. His vote was Andersen. He made the point that, if the team were to lose Andersen for any length of time, they would miss him more than any other player. Recent history seems to support that point. When Matthews was missing, the team hung in there. But a stretch of games without Andersen would be scary. Interestingly, in a poll of fans, TSN 1050 radio ranked the four current Maple Leaf stars as MVP. Fans voted Mitch Marner as the most valuable Toronto player at 39 percent, Andersen second-most valuable at 28 percent, Rielly third at 23 percent, and Matthews came in fourth at 10 percent of the vote. 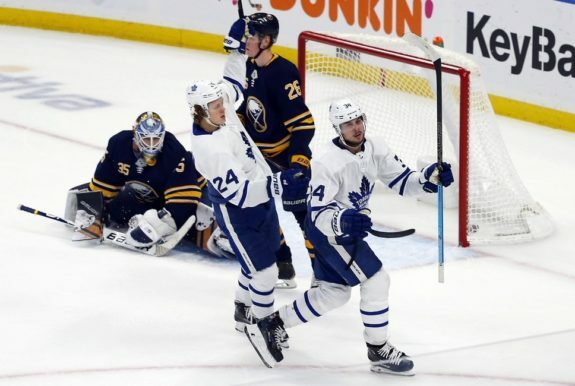 Starting on Jan. 3, the Maple Leafs resume a three-game home stand where they meet the Minnesota Wild, Vancouver Canucks and Nashville Predators. Of those three teams, the Canucks might be especially interesting to see. Although their record is 19-18-5 and are fifth in the Pacific Division, they have two young centers worth watching – Elias Pettersson and Bo Horvat. The NHL has known about Horvat for some time, but Pettersson is in his first season and is leading the Canucks with 39 points (19 goals, 20 assists) in 35 games. He looks to already be a star.